(Human Barbarian/Oracle): Ulric stands at an even 6 foot, blond wavy hair flows down to his shoulders, it is keep off his eyes by a simple leather headband. Bright blue eyes look out from a pale and ruggedly handsome face. His long blond beard and moustache are both braided. Ulric body has a thin frame but it is covered with solid muscle and he is able to push all his physical limits when entering a berserker rage. His long legs can carry him with swift and sure strides. Ulric wears an ornate set of breastplate armor over worn but serviceable travelling clothes made of seal-leather dyed blue and white. The motif on the armor shows a long-ship cresting a wave. Sturdy Whale-fur boots are tied with seal-leather cords. Ulric carries a long hafted great-axe. The grey steel blade, forged by a master-smith of his homeland, has a similar motif to the armor. A fully stocked backpack and numerous belt pouches allow Ulric to organise his equipment, which can at times be of critical importance. 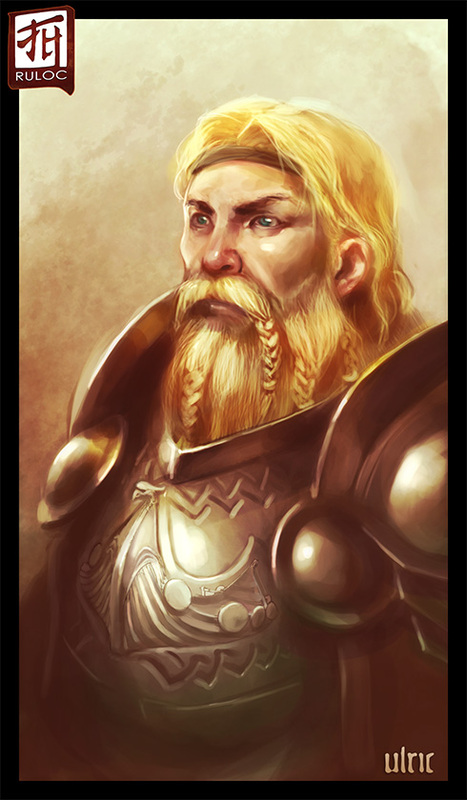 Despite his formidable appearance Ulric has an easygoing nature and is quick to smile. He is willing to buy everyone drinks and tell them tales of his homeland or his recent adventures. However there is something slightly odd about him, to most people it is just a minor feeling of unease caused by strange noises, odd shifts of breeze or a drop in temperature. To those with The Sight, mostly harmless but sometimes malevolent otherworldly spirits surround Ulric. These are only able to affect the physical world in some minor ways as noted earlier or rearranging Ulric's gear in his backpack. Ulric is, however, learning to tap into this phenomenon as a source of knowledge and power.